As the warm summer weather arrives, people are venturing outside to take advantage of these long but fleeting days. From picnics and parks to beaches and BBQs, local neighborhoods are full outdoor activities of all kinds. With this summer fun, however, comes some dangers, which is why STOPSignsAndMore.com, a leading U.S. manufacturer of top-quality traffic, road and parking signs, is reminding everyone of the importance of posting “Children At Play Safety Signs” where they live and play. Children love playing outdoors in the summer when school is out, and in their excitement may not pay close attention to the road and vehicles passing by. 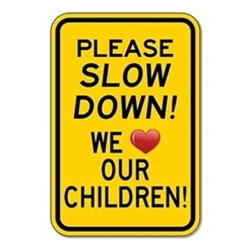 A children at play street sign or even basic slow down signs, complete with the caricature of a child running, is a great way to notify drivers to be aware of young ones running around in the area. These warning signs, which come in an assortment of different sayings, remind everyone to drive slowly and be more mindful of their environment. Everyone supports neighborhood safety initiatives, and these signs promote a safe, alert environment for families. About: Based in Carlsbad, California, STOPSignsAndMore.com manufactures well-known signage including ADA signs, parking signs, pedestrian crossing, crime watch signs and much more; that are easy to install and have high visibility to drivers. Made of the highest quality materials, these customizable signs are made to last 10 years are more so you get value for your investment.